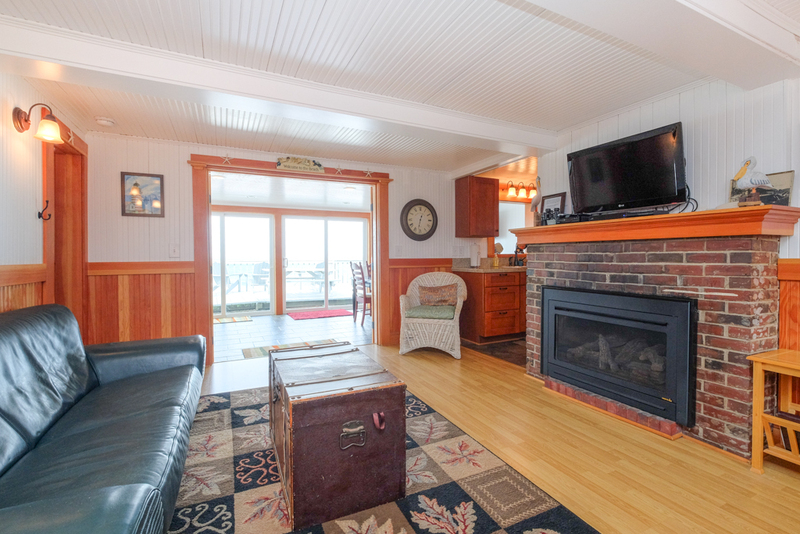 The Submarine is oceanfront with 2 queen bedrooms , cozy living room, beautifully remodeled kitchen and sun room overlooking the oceanfront. 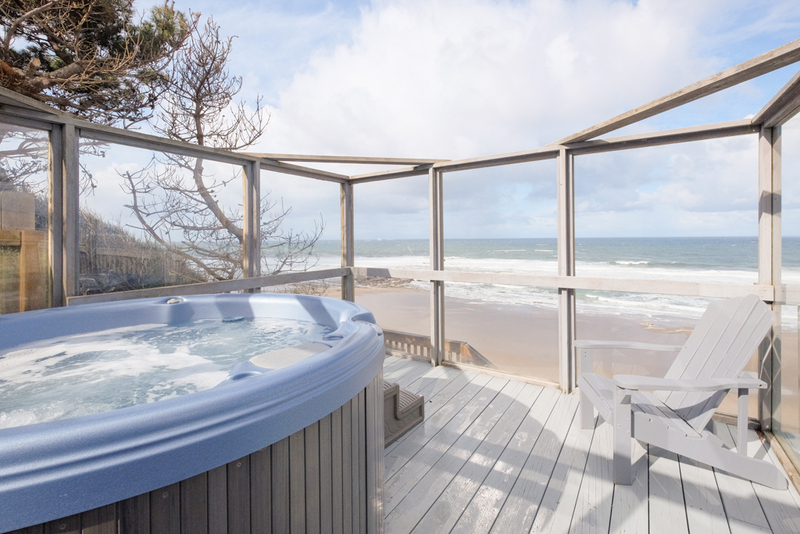 It has a glass walled private hot tub with panoramic views of surf and sand. 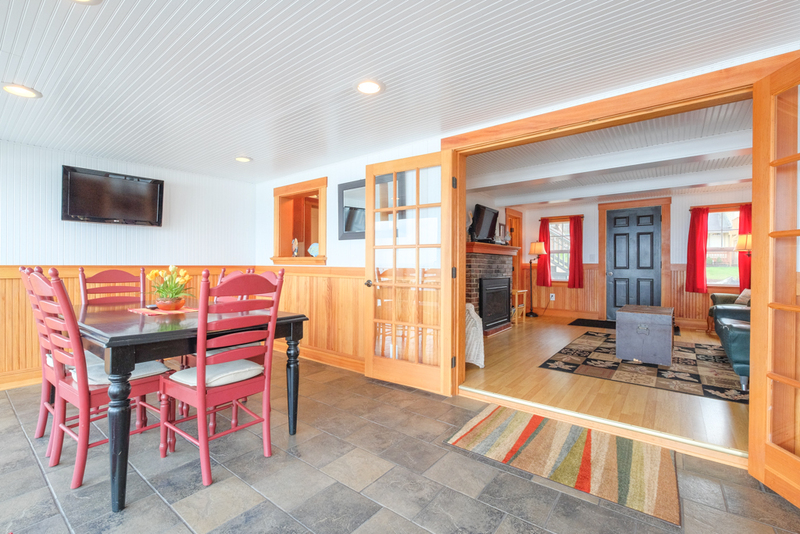 The Sun room opens to your own deck and is perfect for games, puzzles & whale watching or enjoying the surfers ride on the famous Nelscott reef/ wave (approx 1/8 mile off the shore). The beach is quiet & Tide Pools are loaded with treasures during low tide. 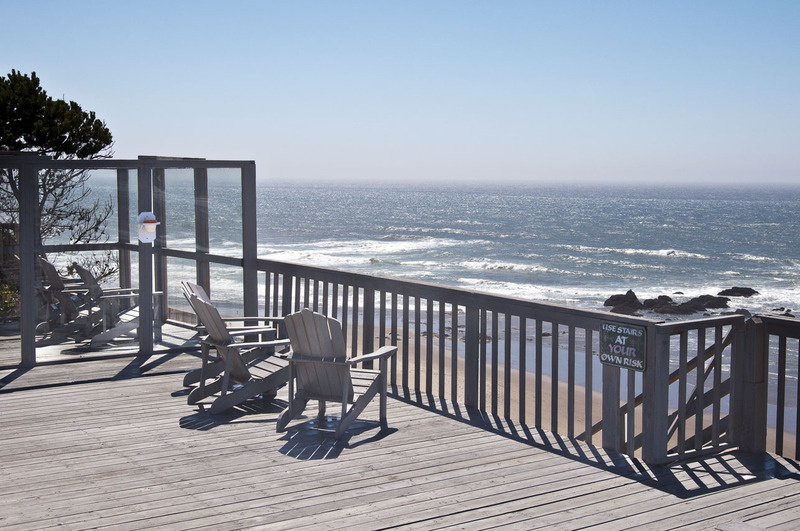 There are plenty of wooden chairs & a picnic table for bbqs or grab your favorite book and fall asleep to the sound of the ocean. Beach access from the deck is 90 stairs where an almost private beach awaits ...not many have beach stairs in this stretch of Lincoln City. The Submarine is the main part of a larger home. It is private from the master suite called Anchor that sits above the garage. They are separate from one another. They each have their own private deck & private hot tub . This house is perched in front of the Nelscott wave. Fabulous view of the surfers. You might also see a whale or two cruising by. Please avoid "Single Night Gaps" June- Sept. & Spring Break. Memorial Day wknd & Labor Day wknd have 3 night minimums. "First of all, you can't do better than ; they are straight shooters and will take good care of you. This house of theirs -- Submarine -- is just perfect -- views, comfort and character. Quiet, safe and inviting. You'll feel welcome the moment you arrive and sleep like a baby to the music of the magnificent Pacific rolling below. Don't miss the beach walks and Lincoln is a great town full of friendly people. The only negative we experienced was the mild sadness at having to leave; we'll extend our stay next time and book direct with A-1 on their website." "What a little gem this place was. The views of the ocean cant be beat. " "I had stayed at the Submarine with friends several years ago and couldn’t wait to stay there with my wife. I had told her all about it many times. As soon as we walked out onto the back deck she understood my excitement about staying here. Can’t wait to come back with more family to share in the beauty of this place." "There were 3 of us at this rental. We loved it. We liked the old house with low ceilings that has been all fixed up. Beds are comfortable, kitchen had everything we needed, and the view was great! Hot tub worked the WHOLE time which is practically a first for us and we love the history of the place! Would stay again. The only thing that would be nice would be more lighting over the stove." - No bath soap or shampoo included. They make a note of this on the profile, but it's something I usually find in other houses I rent in LC. It would be a pretty easy amenity to provide. - A small collection of DVDs, books, and/or games would be nice. Not a necessity, but again something I've found in nearly all other rental houses in LC. - Not something that can be "fixed," but something prospective renters should keep in mind: The two bedrooms are quite small with only a double bed in each. I get a little claustrophobic in double beds when I'm sleeping with someone else. Your mileage may vary. All in all, this was a great rental and I would not hesitate to rent it again so long as it was only for a couple. More than two people and I feel the limited square footage and single bathroom would feel pretty cramped. " "The 'Submarine' is an absolutely beautiful property with incredible amenities and views to match"
"Charming little bungalow on the cliff with amazing views. The house is outfitted very well with everything we needed to make our stay comfortable. Highly recommend it. " Manager Response: So please that you enjoyed the Submarine! Come visit again soon! "We loved the house and the views. The stairs are a little steep lol but worth having the beach access. Overall was very impressed with everything." Manager Response: Glad you enjoyed your stay at the Submarine! Visit again soon! "Amazing view from the great deck! Climbing down the stairs easy enough. Found treasures walking the beach. Favorite restaurants within walking distance and very close to the Outlet stores." Manager Response: Thanks for staying at the Submarine! Come again soon! Beautiful ocean view. The house is old, but got some renovation and has a remarkable history. We'he got lucky with the weather and spot a few whales during our stay. We definitely recommend this place and will come here again." Manager Response: So glad that you enjoyed the whales and the Submarine! Visit again soon! "This small house was perfect for a girl trip with my daughters. Loved that there were views straight out to the ocean everywhere. The deck was huge. The hot tub was delightful. The steps were very doable. We went down to the beach several times a day. Most times we were the only ones down there. There are tide pools near the bottom that are fun to explore at low tide. We spotted the whales on our last day. Great central location to take day trips up and down the coast. Many stops nearby. Would recommend. " Manager Response: Glad you enjoyed the whales and the beach! Come again soon! "What a beautiful home! Watched whales and got to walk on the beach everyday. Absolutely recommend this house!" Manager Response: So glad you enjoyed Submarine and the whales! Visit again soon! Manager Response: Thanks for visiting! Hope to see you again soon! "We had a fabulous stay at The Submarine!! I rented the Submarine for 4 days to celebrate Father's Day with my husband and our two school-aged daughters. We found the deck, hot tub, and beach to be the highlight of our weekend! Inside we very much enjoyed the fireplace. The Submarine's location can not be beat! I was also impressed with the overall cleanliness of the rental. The back bedroom and bathroom are small, but for a family of four we cozied up and were just fine! We explored the tide pools on the beach extensively, finding many cool small shells. We spotted whales and seals from the deck and hot tub. Unfortunately there was fog and clouds during our whole stay, it would be worth a return just to see a fabulous sunset. I am SURE they are AMAZING from the deck! I would note one thing (not to detract from the property at all, but just because I missed these details in the original listing and thought future renters might as well). There are two rentals attached in the same house. They keep the top floor open if you rent the Submarine, but there is a unit over the garage that was rented out during our whole stay. They have access to their own hot tub, but the deck, stairs to beach, and laundry is shared. It was not a big deal, just a surprise. Also, if you want to use the toaster move it out of the little "butler's pantry" area off the kitchen, otherwise the smoke alarm will go off...making you feel guilty for disturbing the other unit! Overall I would return to the Submarine in a heartbeat, we loved our stay there!!!" Manager Response: So glad you enjoyed your time at the Submarine! Please come again soon! "This house was fantastic. The view grabbed hold of you the minute you walked in. The open layout and many windows in the dining room let you remember each minute that you were on vacation. It was a clean and updated home." Manager Response: So glad you enjoyed the Submarine! Please come again soon! "We will totally be back! I loved the hot tub experience overlooking the beautiful ocean!" "The Submarine was a fantastic place to spend a weekend away with my husband! The location was great with a mostly private beach and a gorgeous view! We watched the sunset from the hot tub, enjoyed whale watching while eating dinner, and long walk on the beach. The property itself was clean and charming. Overall we were very satisfied! (The beds were a little hard, but it's such a small thing when you can go relax those sore muscles in the hot tub!)" "Perfect spot for a vacation." Manager Response: So glad you enjoyed the Submarine! Please come back again soon! "Can't say enough about his property. It was a perfect getaway for a few days. The house was clean and in good condition upon arrival. We had no issues and therefore didn't need to contact the property management people, but instructions were clearly laid out should problems arise. Also, THAT DECK and THAT VIEW!!! Just beyond amazing. A couple of ideas for updates in the future: a better set of knives in the kitchen with a honing tool to keep them sharp, some extra towel hooks in the bathroom or bedrooms, and some cozy patio blankets to curl up under on those windier, cooler days. Otherwise, it was just perfect!" Manager Response: So glad you enjoyed your time at the Submarine! Please come again! "We had a wonderful stay at The Submarine. It was very clean, well stocked, and had an amazing view. The trip down the stairs was a bit steep but, well worth it for the semi-private beach access. The hot tub on the deck made this place just all the more inviting. We would definitely stay again. " Manager Response: Glad you enjoyed your time at the Submarine! Please visit again soon! "Been coming for our 10th year anniversary, always a wonderful experience!!!" Manager Response: So pleased that you enjoy the Submarine! Hope to see you in 2018! "our family has visited your vacation home many times. It is the best!" Manager Response: Glad you had a great stay at the Submarine! Hope you visit again soon! "We absolutely loved the Submarine. Second time staying there and will definitely be back." Manager Response: Happy that you had a good stay at the Submarine! Come visit again soon! "The house was great and in a great location! Even though the weather wasn't optimal the large windows made for some great storm watching. Hot tub was in excellent shape and has an awesome view of the ocean while soaking. We will definitely be staying here again." Manager Response: So glad that you enjoyed the Submarine! Please visit again soon! "We rented the Submarine property in Licoln city for the second time. Although it is an older home, the accomodations are excellent and the view is incredible. The hot tob looking out over the ocean is beyond compare. 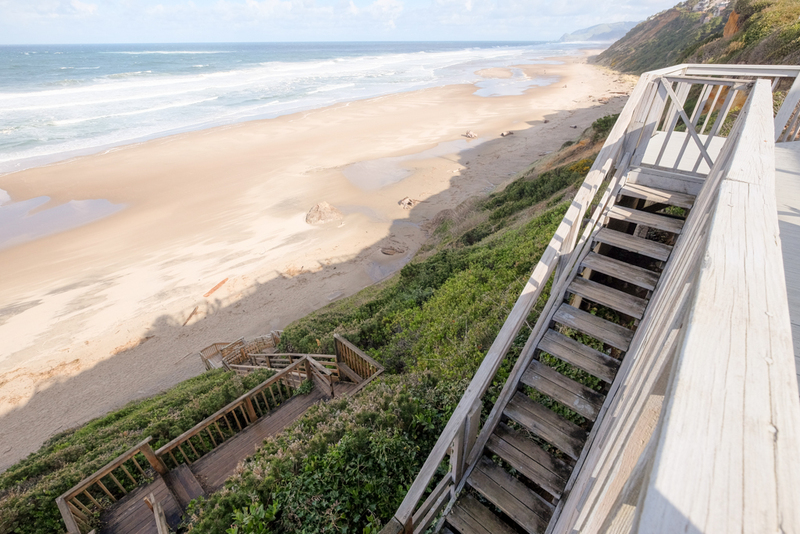 We love the 100+ vertical steps down to the beach too. 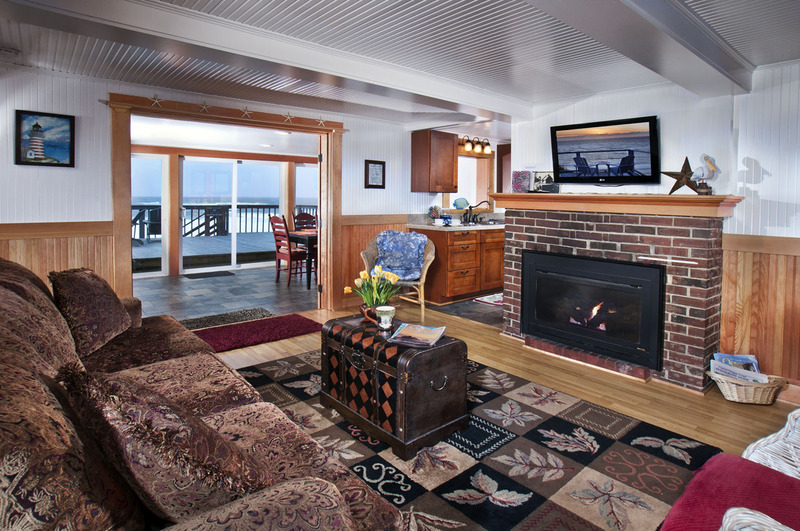 The back side of the suite is all windows, so even if it is a rainy day, it is a perfect place to spend time playing games with your family and watching the whales swim by!" Manager Response: So glad that you enjoyed your time at the Submarine and seeing the whales! Hope you visit again soon! 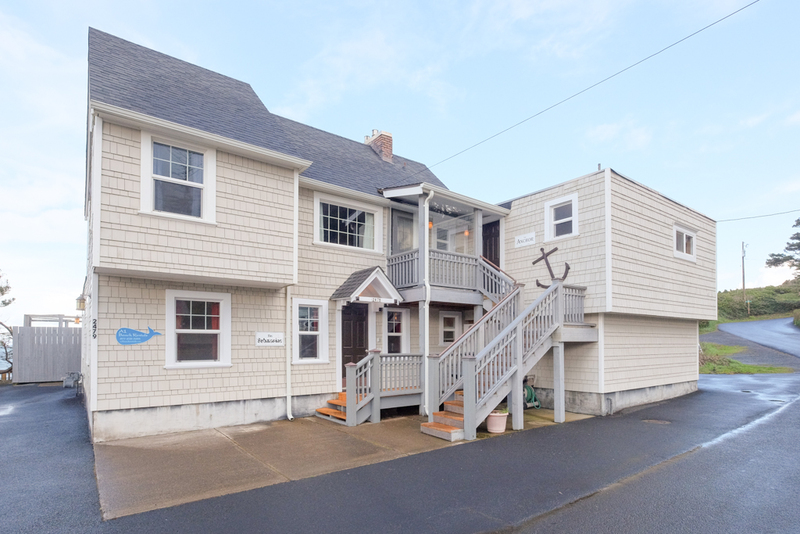 "Great location and beach access, house old but clean and had everything we needed. We'd stay again." Manager Response: Glad you enjoyed the Submarine! Hope to see again soon! "Very nice, would love to stay here again sometime hopefully I the near future"
Manager Response: Glad you enjoyed the Submarine! Hope you come again soon! "Beautiful view and whales put on a show for us. Rental was clean and had everything we needed. Thanks for a great stay. Weather cooperated and was wonderful." "Another great visit to the Oregon Coast. Wonderful views, day trips, and sea food." "We had an amazing time. The place was very comfortable. It would be nice to say in the guestbook where the washer and dryer is located. It took us a couple of days to find them." "It was a great house for my wife and me. Very comfortable. It has a tremendous deck. A great hot tube protected from the wind. Very clean. The bathroom is tiny and thee was mold on the inside seems of the shower, but that is a challenge to the cleaning people and needs to be reported. Would we rent this again...yes"
"The Submarine was a vary nice vacation destination for my wife and I. Utilized the deck the most as the weather was fantastic. Overall everything was very clean and had pretty much everything that we needed. The only detriment was that only one set of jets in the hot tub was working, but that didn't bother us too much as the weather was too warm to spend much time in it anyway. This was the first time we had rented a house rather than using our Trailer, and we would definitely do it again." Manager Response: Thanks! We're glad you enjoyed your stay! 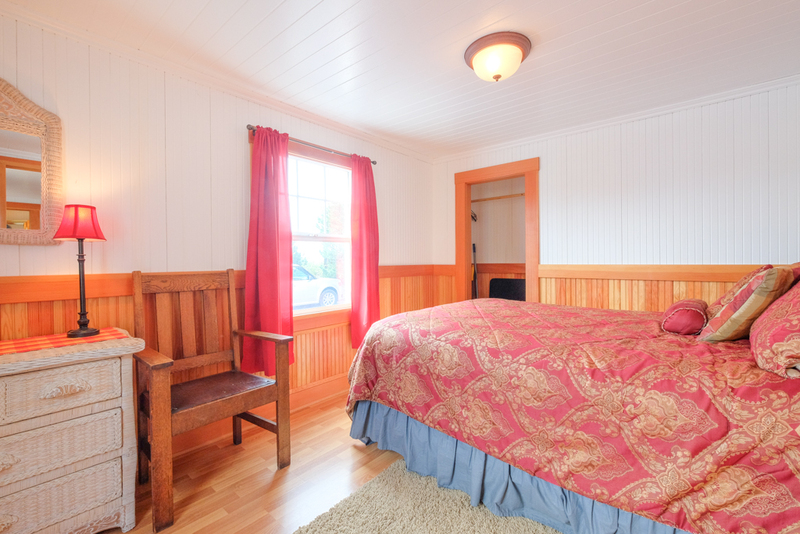 "Very pleasant place to stay, only negative was the seating was lacking for comfy chairs and couches. " "Fun quiet time. Really Stormy and cozy....."
"We had a great view prefect weather complete relaxation, wonderful thing we had distant family and it was a great place to entertain. Plenty of room didn't have to buy anything for the kitchen except food. Hot tub was always at 103 degrees awesome to set in an view the ocean whales dolphins and surfers. We will for sure be back. " "Liked the location, very uncrowded beach. The fireplace provided a very warm ambience. Neighbors were pretty quiet. Was disappointed with the hottub. Many jets were not working. When there are guests renting the upstairs home, it starts to feel more like a hotel stay and less like a nice vacation home. Still overall we enjoyed the weekend stay." "Incredible location and a very comfortable house. We thoroughly enjoyed our stay. We definitely plan on coming back maybe in the summer thank you very much!" "Very relaxing stay. Great view and the hot tub was perfect." 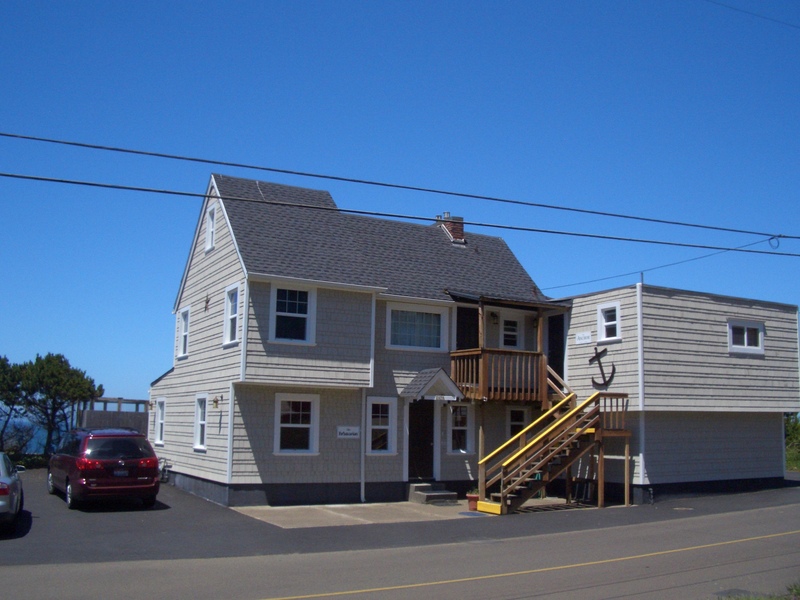 "I rented the whole anchor and sub 2 nights and just the sub one night. I don't think the pics online give you much of an idea of how it is laid out. I didn't like the fact that there were 3 separate entrances and that the spaces did not connect from inside. It is a very unique place, woodwork in anchor is beautiful, hot tubs are great.Found the spaces to be clean and in good condition. The decks and views are wonderful. Did not like that at the end of the steps to the beach you had to jump or use a ladder that was there. The living area is small when you have all 10 guests but can overflow into dining area. My friend slipped on the last step coming down from the anchor as it was slippry and the last couple steps did not have the the gripper strips on them...I'm gonna assume they will take care of that. Overall we had a fantastic time...luckily the weather was good so enjoyed the outside spaces. "We visited last year for 4 nights and knew we needed more this year! - so we spent a glorious 7 nights with friends! 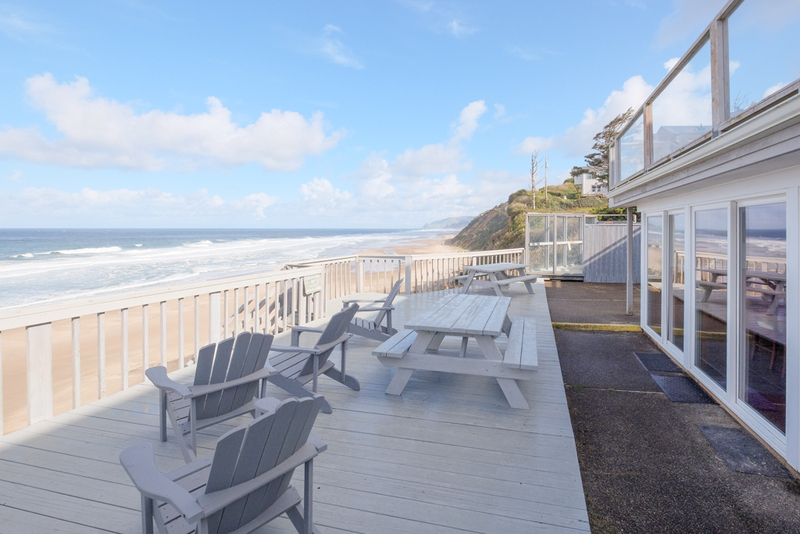 The accommodations are wonderful with of course the amazing beach and view - and the weather cooperated too! Lots to do nearby from the Oregon Aquarium to glass blowing to the Air and Space Museum. ... just a few things would have made the stay perfect - we did purchase 2 more frying pans (and left 1 behind)... more dishes i.e. plates would have meant not needing to put the dishwasher on as much... and it would be nice to have more than a "starter" of t.p. and paper towels... but really these concerns are minor and I would do it all again!!" "Four adults stayed for a week without any issues. We had great weather, watched whales from the deck, walked the beach & enjoyed sunsets from the hot tub. We had plenty of towels, dish soap & laundry soap. Everything was as described. Great central location for North & South travel. " "Our children found A-1 Beach Rentals first. Since then its been a favorite of the whole family." "This place was recommended to me by my sister in law and I can't thank her enough. Everything throughout our stay was phenomenal. 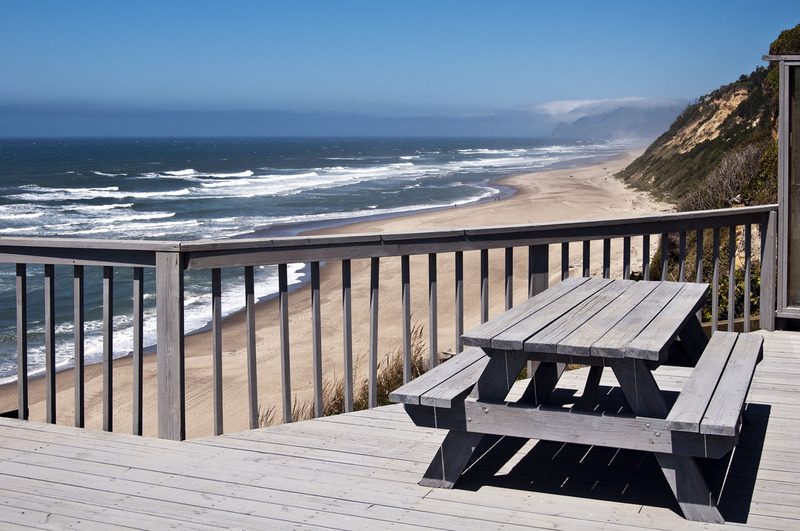 Ever since I've gotten home I've been recommending A1 beach rentals to all my friends that are looking for a little Oregon getaway. Clean property. SPECTACULAR view. We will most definitely be back. " "My daughter & I had the BEST mother/daughter weekend here! It definitely helped that the weather was gorgeous. We made full use of the deck and the hot tub. The view is fantastic! We even enjoyed the sore muscles we got from going up and down the stairs to the beach-- what a great workout! The beach was not crowded at all and seemed like a private beach. So, so nice! The kitchen is small, but adequate. The sun room was amazing-- what a view through the sliding glass doors! We couldn't figure out how to turn the fireplace on, so I called and spoke to Karen - she was SUPER friendly & helpful. The location was great! It was close to everywhere we wanted to go. The only thing I didn't care for was the bathroom. There's mold in the shower-- I can tell it's under the clear caulking & I can see how that would be hard to clean other than removing all the caulking. Plus the shower is so tiny, one can barely move in there. But hey-- I didn't go on vacation to spend all my time in the bathroom, so I didn't mind. We want to make this an annual tradition & will definitely want to rent this house next year! Thank you for renting us your cute house!!" "very enjoyable 3 days quiet. almost private beach beautiful view. 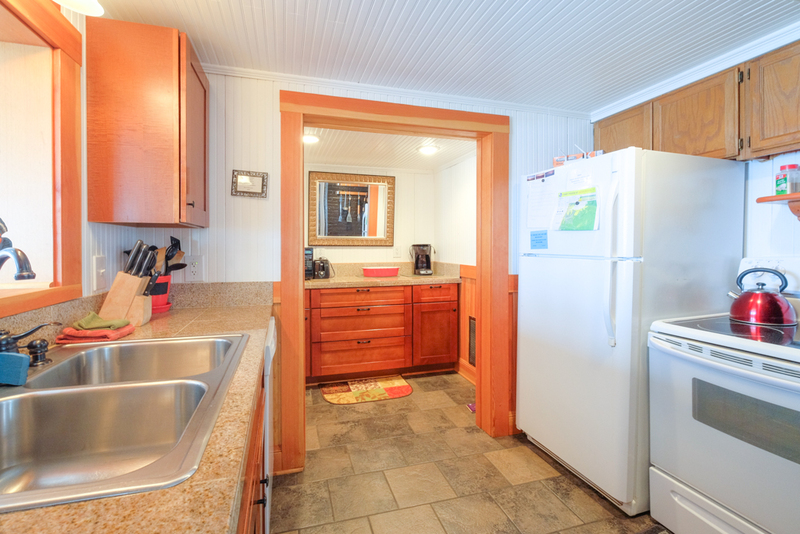 clean rental small but quaint an beachey feel." "This house is wonderful. It was clean and best of all had a fantastic view and a hot tub on the deck. Located close to stores and restaurants." "It was awesome great view good time. Beds was a bit small but we are big people but other wise very nice." "Overall we had a great time. 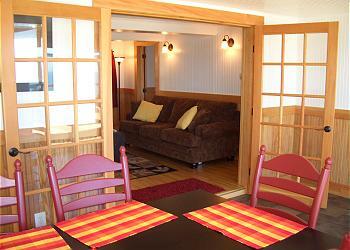 This is our second year renting The Submarine, and it is a perfect property for a couple. It is very clean and the amenities are good--might need to upgrade some of the kitchen tools. We cooked in 5 out of 7 nights and could use a couple of new pans and some updated knives. Other than that everything was great again this year." "We enjoyed our stay here so much! The location is fabulous! The views were breathtaking. Ended up I got a rotten cold just as we arrived and it rained at lot while we were here and I STILL had a fantastic time here. We watched whales from the deck. The house is quite rustic, in fact we came to refer to it as "the cabin". The kitchen was well stocked and the beds were comfortable and the place was clean. I loved it here and hope we can come back some day!" Manager Response: So glad you enjoyed the whales! We hope you visit again soon! "an ocean view all to you self, no close neighbors, with fully equipped kitchen. What more could one want?" "We stayed in The Submarine for two nights in July. The house was nicely appointed, what you would expect of a beach house in this area. Bed was comfortable, couch was cozy, had all the linens and furnishings needed for a great vacation. But the view - amazing!!! And the stairs to the beach were wonderful. You just can't beat oceanfront. The hot tub was an added bonus to watch the sunset and relax. The highlight of the trip was whale watching for 2 hours on our second night. We got great pictures and checked off a bucket list item. Did not expect to see whales in July and the binoculars in the house made it a wonderful sight to see. We will definitely stay again!" Manager Response: So happy these guests saw whales. The summer has been a feeding frenzy out in front of the Submarine! "Great. The house was just a described and viewed in the pictures, perfect space for two couples. Loved having the steps to the beach. We had one small issue and Karen and staff were very responsive. We will rent again on our next visit"
Manager Response: So glad we were able to take care of that. Please come back again soon! "This home had all we needed in such a small (manageable)package. Since my family is all small in stature (I'm the tallest at 5'6") this home fit us perfectly. The only caution to anyone considering a stay in this home, is the shower stall is just big enough for me. If you need much space while you shower.... you'd be better suited elsewhere. But that is the only thing keeping the Submarine from getting a perfect score. - 180 degree, unobstructed view of the ocean, 111 steps up from the sand. - ocean side wall of the house is 100% glass. - hot tub is exposed to the view, but still sheltered from the wind. - the home resides in a neighborhood, away from "hub-bub"
- laundry facility on site"
"it was fantastic! Loved the house!" "When we first arrived at the house, we all noticed the amazing view out the back door from the front door. The house was really pretty and well set up. The view from the deck was my favorite part. We were able to sit outside and enjoy the sunrise and sunset without anything blocking the view. We also saw whales right out in front of us. There were plenty of dishes, towels, and places to relax. A nice big dining room table for family meals and puzzles :) We wI'll definitely be staying here again." Manager Response: Thanks for your kind review! We are pleased to have you visit! Come back again soon! "This place was awesome! The view was amazing and the place was very clean:) Definitely will be going back again:)"
"We absolutely loved staying at The Submarine. The view of the ocean was beautiful as was the unit itself. It was great relaxing in front of the fire, but even better to do so in the hot tub while listening to the waves roll in right beneath us. We would definitely come back to The Submarine!" "Peaceful, homey, relaxing, cozy. " "Amazing view- great place. We really loved it overall and highly recommend it. The only downside was the scheduling of the spa maintenance guys. We stayed mid week so maybe that was why but both days they came to service the hot tub without notice in the morning ( my favorite time to use it). I don't want to deal with maintenance during my vacation, wish they would have come after we checked out. Also the adjacent unit was not rented out so we did feel like we had privacy but not sure I would have enjoyed it as much if there was another group on the property . Even though there are separate spas, the deck and staircase to beach is still shared. Really enjoyed our stay and would definitely return. "Surprised to see that we were so high up on a cliff, the pictures were a bit deceiving. Stairs leading to the beach in need of repair. The view was amazing! The house was clean and comfortable,kept up nicely. Privacy was an issue on the deck. Hot tub was clean and kept at a nice temperature. Overall it was a great spot, and the history on the house was interesting as well. Thanks A-1 Beach rentals we will return! " "updated, classy, convenient...will definitely be back." "The Submarine was a very cozy and comfortable home. The house was neat and clean and all of the amenities were there. Would definately recommend it to others. A-1 is an awesome company to work with." was nothing short of spectacular. Very nice!" "Awesome view, great location. Steps a little scary. Had to share porch was a little odd. Didn't have to share hot tub though. Didn't know washer and dryer was on property til last day"
"Such a cute place. Loved the windows so we could see the ocean as we ate. 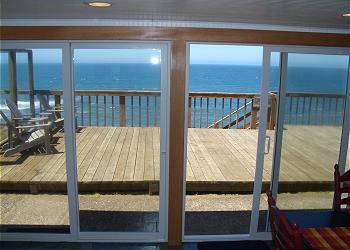 Also wonderful view of the ocean as you sit in the hot tub. We'll go again!" 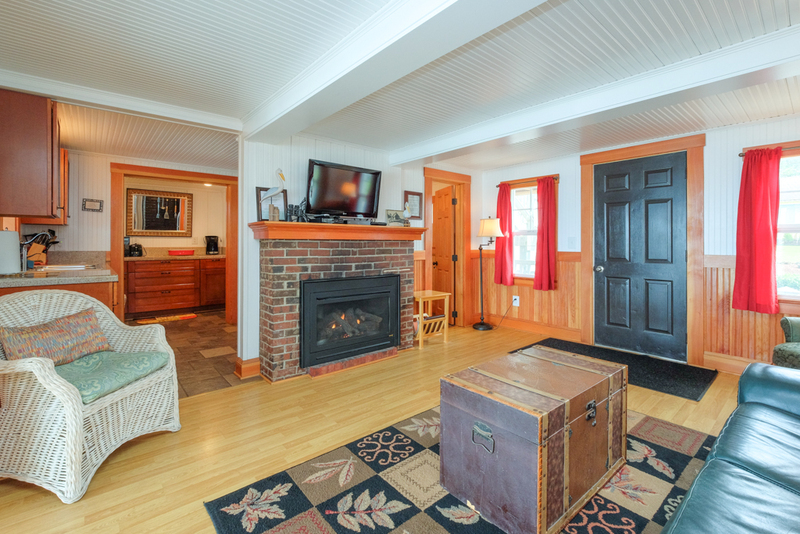 "The house is cozy but very well kept, had all the the little extras we could ever need. The Family Had A blast and a workout climbing the stairs to the beach. The view is endless and even on the rainy days we still enjoyed watching the waves and relaxing by the fire. Overall it was a fantastic experience and would definitely recommend to anyone. " 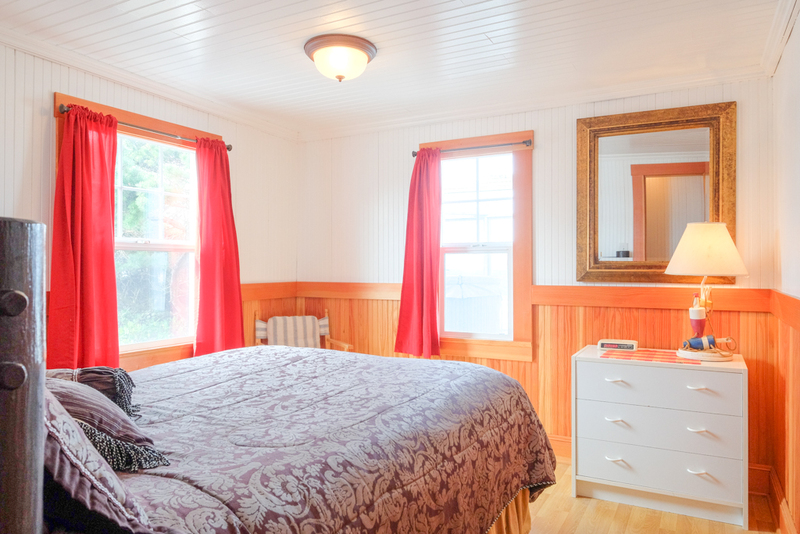 "Made a great first impression and will definitely be renting this vacation house again and making it a regular destination. I believe the dishwasher was broken... It ran and ran for over 2 hours on the washing cycle. That would have to be my only complaint. " "It was really lovely! We loved staying here. The deck is awesome, the stairs are steep and there is a lot of them, but you get used to them. The house is adorable, kitchen is well equipped! The ONLY thing that was frustrating was that there are no shades on the deck window/doors. The sun was beating down so much at dinner that we really could barely sit at the table. I hate complaining about the sun, since it isn't always present at the beach, but this could have been so much more pleasant with just some sun shades. Easy fix. Other than that, we plan on returning in the future, we LOVED it! 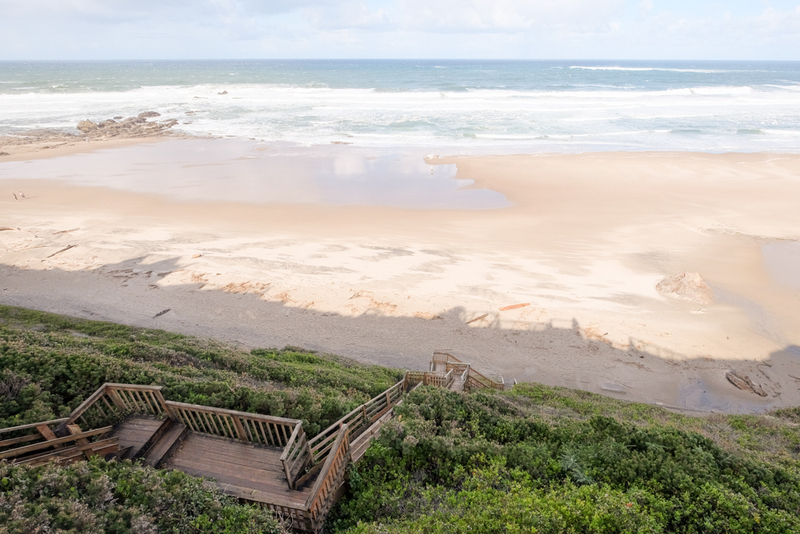 The beach at the bottom of the stairs is pretty much private and really beautiful!" "The Submarine has a breathtakingly beautiful, postcard perfect view of the ocean and beach! I LOVED the glassed in dining room in which to enjoy that view without going out in the cold. Didn't see any whales, but watched the whale watching boat right in front of the property. The rental was clean and very well stocked. Plenty of towels, dishes, and cookware. All we had to buy was a vegetable peeler and scissors, which we left for the next renters. We really liked the split kitchen set up! Easy for two people to work together with room to spare. The gas fireplace in the living room was a nice bonus for the chilly nights. We didn't use the hot tub, but it is in a plexiglass enclosure on the deck to cut down on the wind. Nice! Comfortable, clean, well stocked rental with an amazing view. Wonderful!" "We rented the Submarine two years ago and loved it so much we returned this year. Great access to the ocean and an amazing view. " "Had a great time with another couple here at The Submarine. 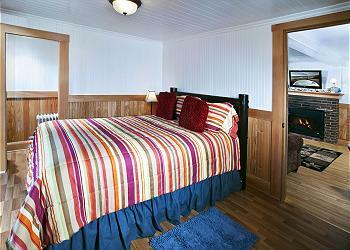 Great views, great deck, comfortable beds. The only difficulty was cooking at the stove - the kitchen layout is weird, and you don't have much room to navigate around the stove. Otherwise, we had a great time and I would definitely stay here again!" 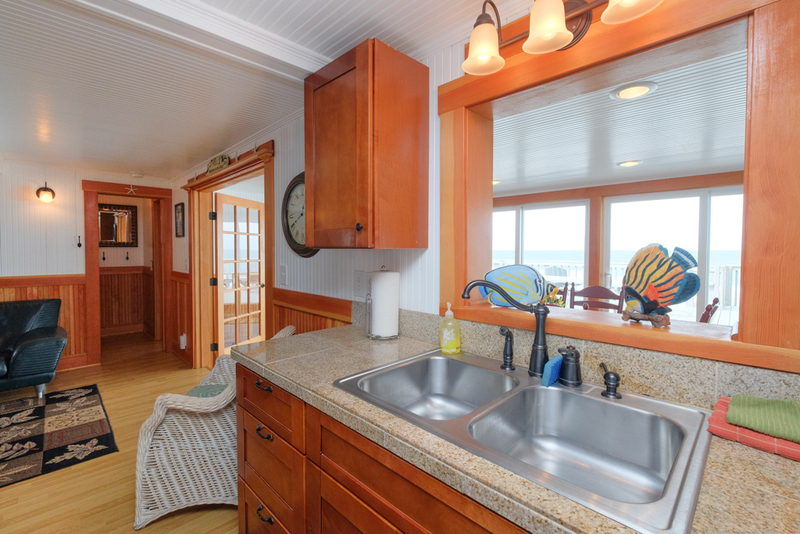 "Beautiful rental in a terrific spot! "This property is simply AMAZING, i can't tell you enough how beautiful the view is, pictures simply do not do the justice. The house is a little outdated and the furniture is not all that confortable but we did not spend any time inside. We spent all our time either on the beach or out on the patio. We ran into a little scenario with the shower where we couldnt control the temperature, the water ran either too hot or too cold. Finaly on the second day we were able to figure out a trick on how to keep the water at a normal temerature. We will definately come back to submarine again very soon! "This property is incredible! 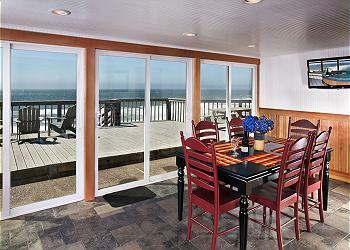 The house is very private and quiet, with a breathtaking view and beachfront access. The interior was beautiful with modern edge. It is a very classy, romantic stay and I will definitely be returning as soon as I can! " "We stayed 5 nights at the Submarine in early July and had a great time. The view does not disappoint, it was everything we were hoping for and then some. Loved the enclosed hot tub especially with the wind and cool air we had for most of the stay. Only issue would be some of the kitchen supplies that are dated and running out (knife set was just awful, we had to buy our own and there is literally no small plates, only large one and only one serving plate). Also, I have never had to buy my own kleenex and toilet paper when renting a property so that was not cool. Still, those are details and we would definitively love to come back!" "We loved staying there. 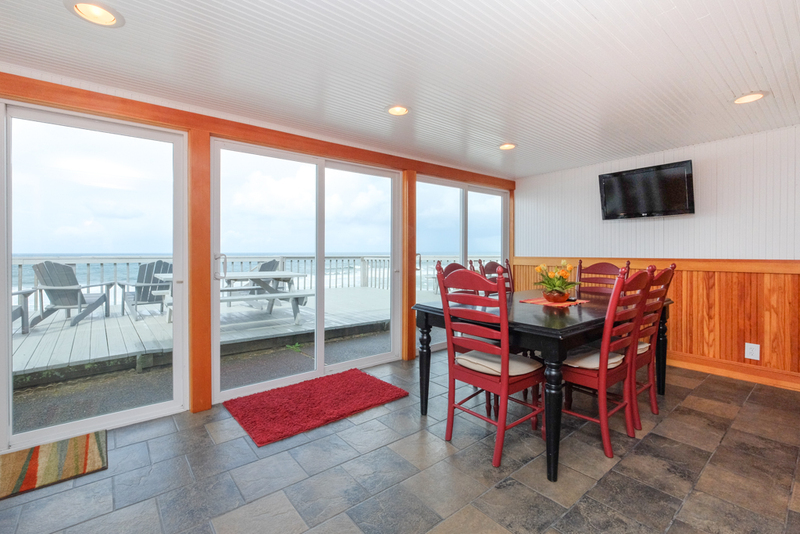 While the accommodations are small it was the amazing amount of glass, views, and size of the deck that made it the perfect vacation spot for our family!" "Everything was first rate! The only very minor issue was the low water pressure in the kitchen sink, however, that very minor issue was easily dismissed by the the rest of the property. I have already recommended this place to 4 other people and I hope to be an annual visitor to this house. Thank You!" "Was not happy with our experience. 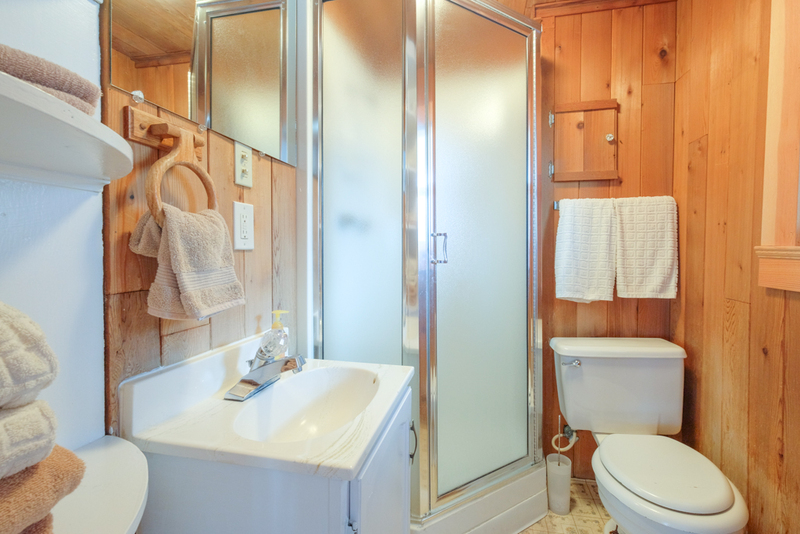 The bathroom was very small with not much water pressure and the fan was very dirty in the bathroom. There were no TV channels except the very basic. Quite a few of the jets in the hot tub did not work. We also think there may have been a mouse in one of the bedrooms. There also was not much security, no rods to secure the glass doors at night and one little lock on the front door. Some of the outside lights were not working. Paid way too much for this place." "fine, great view, nice access to beach"
"I have stayed at this location 5 times--I absolutely love it. The view and the Simi-Private beach is awesome. My first choice in Lincoln City to stay. Great hot Tub and View. I will be back again. Thanks for the opportunity and great accommodations. "It was really nice,the only thing we did not like was lack of privacy!" "This was a beautiful location. Very clean and so romantic! " "Our rental experience at the submarine was excellent. The rental was as advertised and very clean with great amenities." "My wife and I had an enjoyable MLK weekend while staying at The Submarine in Loncoln City. 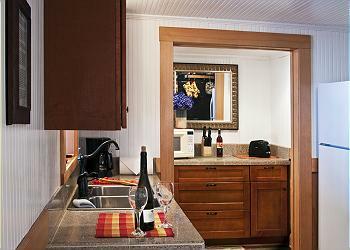 Comfortable beds, a great view from the deck and dining room, and a warm and inviting hot tub to relax in. Didn't even mind going down the 107 steps to get to the beach. The ladder at the bottom could be upgraded though. The only reason I did not give it a 5 in property condition is because the water pressure was week and the shower was a little small for larger people. But, yes I would stay here again . "Awesome, great location, great place, great weather, great view, great staff for questions about property." "... from the moment we stepped into the Submarine we thought we were in heaven! There was lots of room, comfortable beds and everything that we needed to make our four days comfortable. The deck and hot tub were great. The steps to the beach were easy and so nice to have right there! The location was awesome being in Lincoln City and close to other activities on the coast. I would definitely recommend this property as a vacation paradise - we were fortunate with good weather and fabulous sunsets and starry skies... we just don't want everyone to go there as we might not find our next booking available!!" "This was the perfect get-away for the ladies in my family. We could not have been any more pleased with our accommodations. Beautiful view, perfect mini vacation. We will be back! " "This was an excellent rental for our family of four. We loved the patio, the hot tub, and the tidal pools and whale watching right in our front yard! 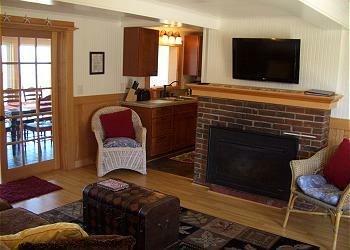 The house was cozy & well-equipped, and made a perfect home base for our seaside get-away. " "Amazing view. The house was cozy and fit our family perfectly. " "what a delightful oceanfront home. Very comfortable and what a view! They had everything we needed for a comfortable stay. The stairs to the beach were a challenge for one member of our party but she managed. I would stay again! Wish we could have stayed longer." "We had the best time and cannot wait to return. The view was breathtaking and we miss it already!"